Meteor Light is our only runner on Wednesday as the import goes to Sale for his Australian debut. The four-year-old won twice in England last year for the Ballymore Syndicate at Nottingham and Leicester over a mile and a quarter before finishing unplaced behind subsequent Group winner Defoe in a good race at York. Meteor Light has been taken along quietly by Mike Moroney and runs in race seven, the Gippsland Middle Distance Series Heat over 1419m with Patrick Moloney to ride. “The forecast is for the possibility of rain later in the day which would help him with a bit of give in the track,” Moroney said. “He has won on ground they called good to firm in England so it’s not essential. 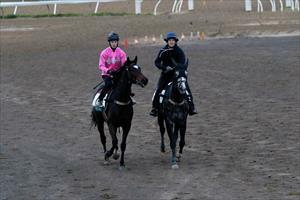 Meteor Light has been given two jumpouts at Flemington to prepare for his debut. “His last jumpout was good but he can be a bit casual on the track - he looks fit enough and he’s got ability,” Moroney said.